The Rangers’ start to the season has been inconsistent, to say the least. They lost two of the opening three games and surrendered 12 goals in the process. The worst of the three games was their performance in Toronto last Saturday. It was a debacle in which they surrendered eight goals. Early on, you got the sense the Rangers were just not right. The best example was Zach Hyman’s first goal of the season. It all started with a turnover in the neutral zone, which quickly turned into a quality chance after Hyman easily split two Rangers defensemen. Lundqvist made the save to keep the game tied but moments later the save was followed up by another turnover, which Hyman buried on a sweet move. But despite allowing four goals to the Colorado Avalanche in their home opener and eight goals to the Maple Leafs, the Rangers rebounded Sunday night against the Montreal Canadiens with a shutout. The Habs might not be an offensive juggernaut at the moment, as they sit dead last in goals per game in the league, but a shutout is a shutout. And considering the Rangers allowed eight goals just 24 hours earlier, well, you take what you can get and build off it. With all that said, I like looking at the positives before the negatives and it is too early in the season to panic. So, let’s take a look at two early season improvements the Rangers have displayed thus far. For years, the Rangers’ power play has been maligned and was always a point of contention heading into the playoffs. Last season they finished 10th in the league on the power play (20.3%), their first top ten finish since the 2006-07 season. That’s a long time to have a mediocre power play and with the offseason addition of Kevin Shattenkirk, the Rangers will look to build on their success. Over the last four seasons, Shattenkirk has had 25 or more power play points. In the last seven seasons, the Rangers have had only one defenseman crack 20+ pp points in a season. That honor went to Keith Yandle during the 2015-16 season when he amassed 22 points. Through three games, Shattenkirk has three points on the power play. As a team, the Rangers have scored four power play goals through three games. Only the Maple Leafs, with five, have more and their 33.3% (4-12) on the man advantage is good for third in the league. Shattenkirk’s ability to move the puck at the point has been on display and he knows how to get his shot through from the point. Even dating back to the preseason, there’s the sense this power play unit with Shattenkirk is moving in the right direction. The Rangers have been a perennial playoff team even with a sub-par pp, so improvement on the man advantage can only help their chances to compete as the season moves forward. Another aspect where the Rangers have struggled over the years has been in the face-off circle. They have not even finished in the top 20 in face-off winning percentage since the 2012-13 season when they finished 16th in the league at 50%. They now have the eighth-best winning percentage at 51.9%. It is early, but that is quite the leap. At this moment, the Rangers have three players in the top 27 in the league, with J.T. Miller leading the way at 63.6%, good for ninth. That is followed by David Desharnais (58.1%, 22nd best) and Mike Zibanejad (55.7%, 27th). It is a small sample size with only three games in the books, but a positive sign nonetheless. In fact, all four of the Rangers with the most face-offs per game this season have improved from a season ago. Kevin Hayes is the lone player not already mentioned, but he is winning at a 50% clip, which is up from his 45.7% last season. Perhaps the most interesting development in this early season is J.T. Miller’s time in the face-off circle. Last season, he only averaged 4.4 face-offs per game. That number has jumped to 11 per game through three games. And it is not just Miller’s total number that has jumped, his winning percentage has sky-rocketed as well. His 63.6% is an improvement from his 44% last season. Don’t expect Miller to stay above 60% all season, but if he can stay above 50%, then the Rangers will benefit. Lastly, Zibanejad’s ability in the face-off circle has been impressive too, especially on the power play. He has taken 15 offensive zone face-offs on the power play thus far, which is tied for second in the league and has won nine of them. His 60% winning percentage in those situations is helpful to start the Rangers off on the front foot on the power play and is surely a contributing factor to their positive percentage. Zibanejad’s skill in the face-off circle will be a pivotal part of the Rangers’ season moving forward. 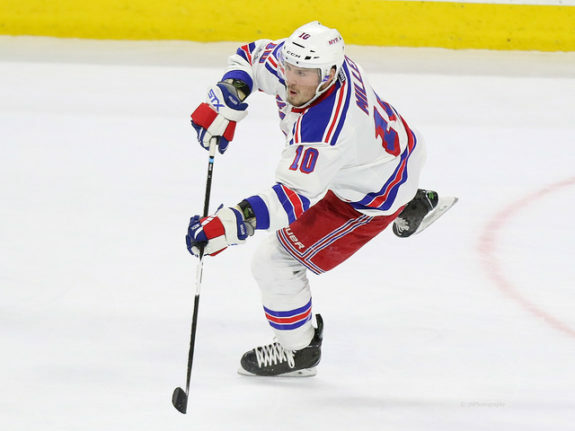 If he continues to demonstrate this type of ability, then the Rangers will likely continue to find success on the power play and perhaps the season as a whole.